Roasted yams are one of my favorite things. Although I enjoy them plain, they are also delicious in warm salads. I use it as a main dish because it contains edamame for protein. When I thought up the recipe, I wanted it to have lots of flavorful elements, so I added sweet cranberries, savory shallots, toasted pecans and a flavorful vinaigrette. I have served this to a few picky eaters, who were skeptical but once they had finished the salad they loved it! It is also a delicious protein packed side dish and would be wonderful with a holiday spread. Enjoy! Line a sheet pan with foil, and spray with non-stick spray. Toss yams with olive oil and spread out on sheet pan. Roast for about 20-25 minutes until starting to brown at the edges and are tender and cooked through. Remove from oven and let cool slightly. 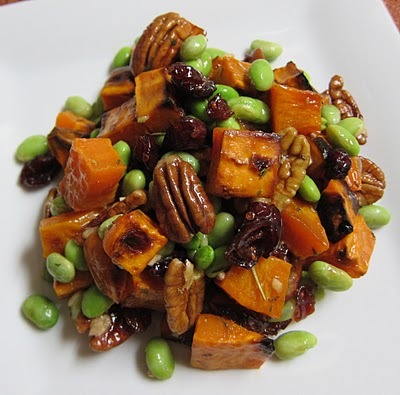 When cooled, combine with edamame, shallots, pecans, and cranberries in a large bowl. Whisk dressing ingredients together in a small bowl and pour over salad. Toss well to coat, and serve!